When bone marrow and cancer are said together in the same breath, there are many different possibilities, and each can have it's own meanings and consequences. First, recall that your bone marrow is like a factory, producing new blood cells all the time. Remember that blood cells include the red oxygen/energy-giving kind as well as white blood cells, the infection-fighting kind. With that in mind, we can move on to the possibilities. It may be that a person has a blood cancer such as leukemia, lymphoma, or myeloma. In some blood cancers, malignant cells originate in the bone marrow. In other blood cancers, the malignant cells spread to the marrow but do so only later in the disease, after getting their start in the lymph nodes or spleen, for instance. When bone marrow and cancer comes up in the same sentence, it might not be related to blood cancer at all. A person may have cancer in the lung, or breast, for instance, and a bone marrow transplant might be part of the treatment; or perhaps there is discussion of the marrow due to metastatic spread of cancer to the bones. 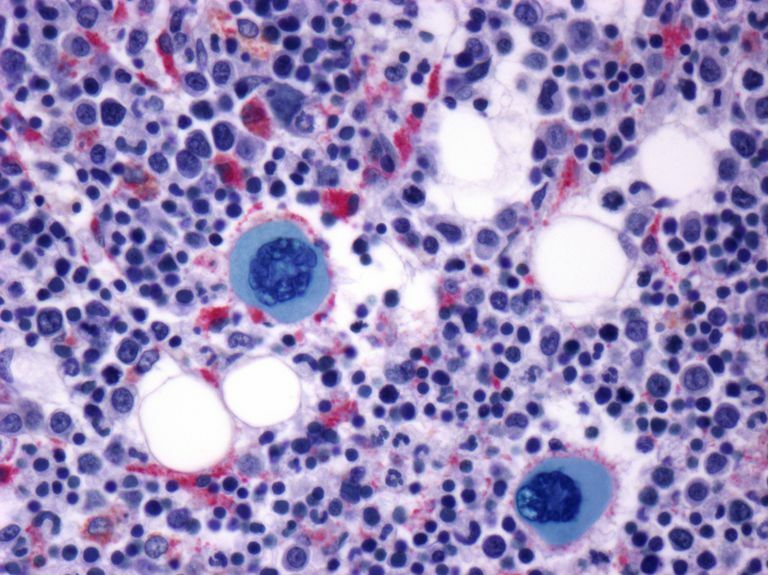 Diagnosis: A bone marrow biopsy may be done to help diagnose a blood cancer. Treatment: Bone marrow or stem cell transplantation may be part of the treatment; as in bone marrow donors and bone marrow recipients. Bone marrow suppression may result from certain anticancer medications, causing abnormally low numbers of blood cells to be produced. Complications and Anemia: Decline of bone marrow function may be a complication of the disease. The reason for a patient's anemia, for instance, may be that cancer, itself, has interfered with the marrow's ability to produce new blood cells. Monitoring Progression: When blood cancer spreads and grows in the marrow, the effects of crowding out of normal cells in the bone marrow can be seen in the bloodstream, or peripheral blood, in the form of abnormal cell counts and/or abnormal cells. Metastatic Disease: Cancer cells from a distant site in the body can travel to the bone marrow and metastasize, or grow and expand at this new site. Other: A comprehensive summary of the interplay between the marrow, lymphatic system, immunity, and cancer is beyond the scope of this article. A variety of blood cancers typically involve the bone marrow. In the case of leukemia, the bone marrow may be the source of cancer—that is, the cancerous cells may have originated in the bone marrow, leading to crowding out of healthy cells and abnormalities in the kinds and numbers of cells produced, and therefore the cell counts seen out in the bloodstream. In lymphoma, sometimes cancerous white blood cells, or lymphocytes, arise in lymph nodes and only impact the bone marrow later on, as the disease progresses. Non-Hodgkin lymphoma generally develops in lymph nodes but sometimes starts in the bone. Crowding out the healthy cells in the bone marrow can lead to different types of anemia or abnormalities of the cells found in the bloodstream. In multiple myeloma, plasma cell growth in the bone marrow can cause bone pain, some of which is thought to relate to bone marrow replacement. In blood cancers and other types of cancer such as lung cancer, bone marrow transplants can be a part of the treatment. A bone marrow transplant is a procedure to replace bone marrow that’s damaged or destroyed with healthy new bone marrow stem cells. In the setting of cancer therapy, this is often done in conjunction with chemotherapy and radiation that kills the cancer cells but also kills the remaining healthy bone marrow. Certain cancers such as breast, prostate, lung, thyroid, and kidney cancers are more likely to spread to bone. In breast and prostate cancer, the bone is often the first distant site of cancer spread. More than 2 out of 3 breast and prostate cancers that spread to other structures spread to the bones. American Cancer Society. What Is Bone Cancer?